THESE SCHNAUZERS ARE NOT FOR SALE THEY ARE ALREADY WITH THEIR NEW FAMILIES. RETIRED means they were bred at least once. Adults for sale will be listed on my Available Adults page, if I have any available. NOT FOR SALE: Bristol retired after one litter and is right here with us! Bristol had her first and last litter in 2011 and was then spayed. She is a wonderful dog and she is still here with us and always will be... I cannot keep them all but my daughter and Bristol are connected at the hip. :) Retired in Jan 2012. Mollie lives with a lovely lady named Susie in Indiana. Susie is retired and has plenty of time to devote to Mollie. Susie said that Mollie LOVES going on walks and we knew she did. :) Mollie loves to play outside and watch squirrels. She sleeps with Susie every night and is enjoying retirement with lots of love and attention. Retired in Dec 2012. Zach has been our main stud and producing wonderful puppies for years. He is now retired. He LOVES his new family and made a wonderful adjustment. He lives in Illinois as of March 2015. Ruger is now living in Texas and enjoying a great life with his new family. He got to fly First Class with his new owner and behaved like a professional traveler. They say he behaves like he has always lived there. He retired in Feb 2015. I am very happy for him! NOT FOR SALE: OLIVER's is retired in California with a wonderful family and they also adopted Jackie three years after they adopted Oliver from me. Oliver is now retired and lives in California only 12 miles from a dog friendly beach. He lives with a wonderful lady that is also retired and has plenty of time to devote to Oliver. He enjoys the beach and going to outdoor restaurants. He retired in March 2015. I am adding TWO video links below. OLIVER is one of my past puppies that also sired two litters before he went to join his new mom Nancy in CA. He joined her in March of 2015 at the age of two. Oliver does awesome with other dogs and all people—he loves to please. So Nancy is having him trained to be able to go into Children Hospital's. Elite Canine Services is featured in the video with the Trainer/Owner Trina. Trina does this training in three weeks! These videos are of Oliver after ONLY one week of training. He has two more to go. I could not be more proud of Oliver and thrilled that Nancy has such a loving heart she took these steps to have Oliver “fine-tuned” so he can be a joy to Children in hospitals. Oliver is the small dog in both videos. In one video he is on the leash walking and the other he is in the stay position. Jackie only had one litter and then we retired her. She is about to be happily living with Oliver and his family in California. She is such a sweetheart and such a happy little dog too! Update on her coming soon. Molly is retired. 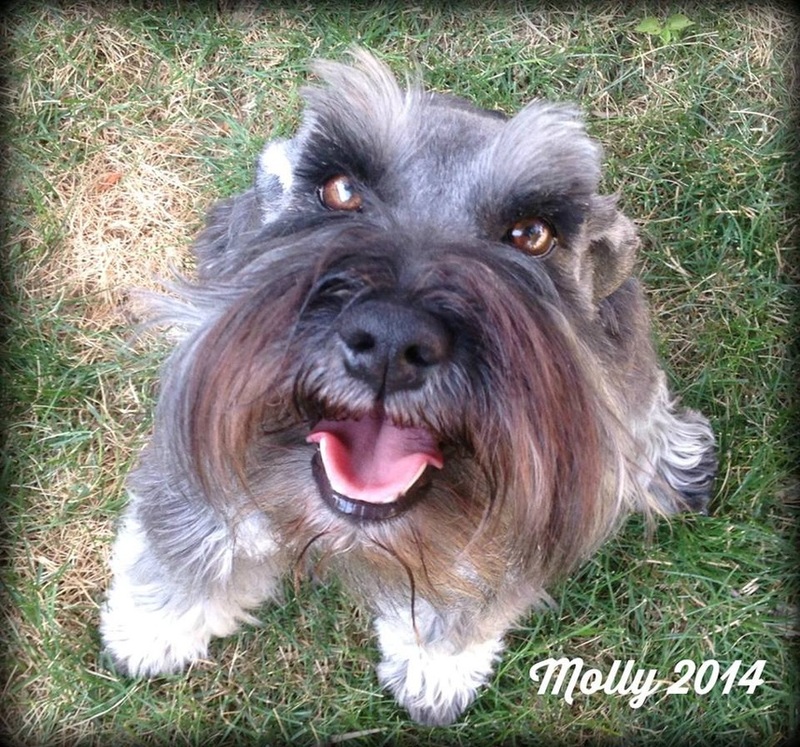 She lives with a family in Indiana that has a another Schnauzer with from me. They said Molly acted like she has always lived with them. She did not skip a beat after joining them. Molly is a wonderful dog that will be missed but I know she will love retirement. Retired in Sept 2015. Aspen now named Zoe was retired in Feb of 2015. The home I had originally placed her was a bit too quiet for Aspen and she started getting depressed. The lady and I decided Aspen needed more activity and the companionship of other dogs too. So Aspen aka Zoe is now happily living with Karen and her family and two awesome doggie pals! Zoe is in heaven and is back to what's normal for her. I truly appreciate the lady (Barb) who had her but was able to let her go. The photos of Zoe with Karen and her family does my heart good! Romie retired in the fall of 2015. She joined one of her past puppies Hawkeye (now full grown) and another Schnauzer from me named Gunner as well. I could not be more thrilled for Romie, Hawkeye and Gunner! Romie LOVES her new home and family! 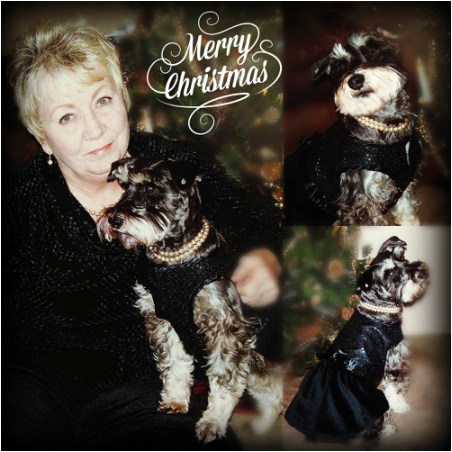 Thank you to the Chambers for being such an awesome Schnauzer family. Carter has joined his new family in Arkansas. They said that he did great meeting their other dogs and that he is doing well. He sired a few litters for me briefly in early 2017. Piper is a total sweetheart. She is fun and loves going on walks. She also like playing in the pool. She loves everyone. Piper loves sunbathing/napping on her back and she passes this trait on to most of her puppies. Piper is Lady BiBi's Mom and Oliver's Mom who is retired above. Piper loves retired life with my inlaws. Ginger is another great dog that is super happy about going on walks and loves her toys. She likes to collect toys and sleep with them. She is laid back and sweet. She loves retired life in PA with her new family. Riley loves retired life in Saint Louis, Missouri. 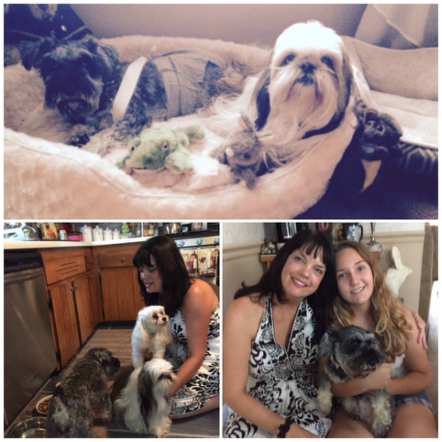 Riley is now retired and we couldn’t be happier that she joined a family who all have Schnauzers from us...Grandma, Mom and daughter.... They drove over 7 hours again to pick up Riley yesterday June 28th, 2018. This is WILLOW. 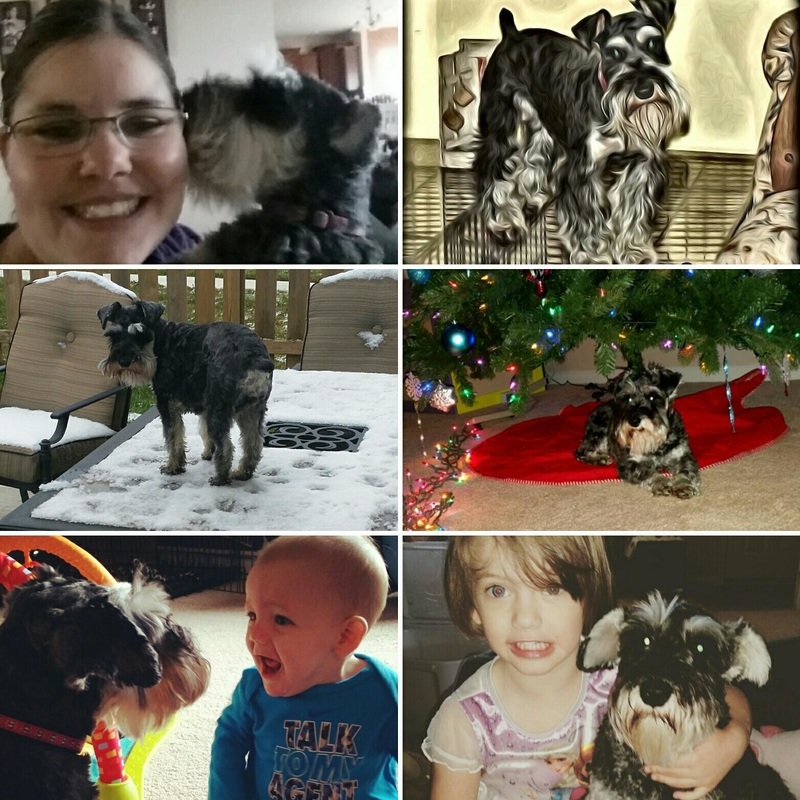 She is Salt/Pepper and she is a second generation Riggs Miniature Schnauzer. She is out of Zach our retired stud. Willow has six Champions in her five generation pedigree. She's retiring in late FEB 2019. Willow is lively and loving. She enjoys going on walks like all my dogs do. She is a sweetie. OFA Certified Heart and Patella. 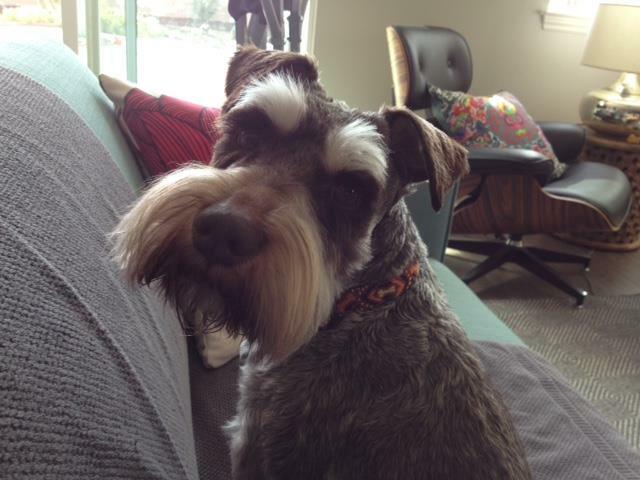 Eve has been adopted into the same family unit who have Riley and other Schnauzers from me too. This is EVE and she is a beautiful Black/Silver. Eve has 19 Champions in her five generation pedigree. Eve is fantastic! She is laid back, calm and loving (is more timid in her nature). She's retiring late FEB of 2019. Kennedy will retire after her spring 2019 litter and she has already been reserved by a lady who has her Uncle that she got from six years ago. This is KENNEDY and she has over 20 Champions in her five generation pedigree. She is a beautiful Black/Silver. 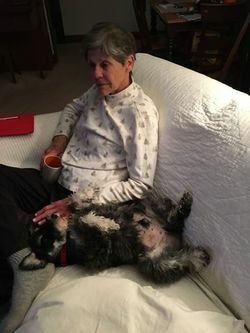 ​She is also a THIRD Generation Riggs Miniature Schnauzer. Her Grandparents are/were apart of my program (Riley and Zach now retired). She is very sweet, athletic (amazing jumper and climber), full of silly energy and also very loving. She is very smart too. ​She is retiring late spring 2019. Remi retires in the summer of 2019, after her 2019 litter goes home. She has been reserved by a family who got a Schnauzer puppy from me in 2017. They also have reserved Vegas for when she retires in 2020. Remington is White HOWEVER she only has Black, Salt/Pepper and Black/Silver with my Sires (no White puppies). She is calm, loving, and ready to please! She likes everyone and gets along wonderful with other pets. With her being White I will be able to have the lighter Salt/Pepper's. She is retiring summer 2019 and is already reserved. OFA Certified for her heart and patella.